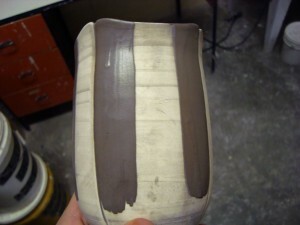 Though quite beautiful, the stripes often found on my cups are the product of a lot of work, none of which is fun to me. I love almost every aspect of making pots, but in the case of glazing, I must trudge through it, knowing my efforts will be worthwhile a few days later as I crack open a new kiln of gorgeous “honeys”. I get many questions about how exactly I glaze my striped pots, so finally, I will guide you through the process step by step. It begins with the mixing of two glazes. 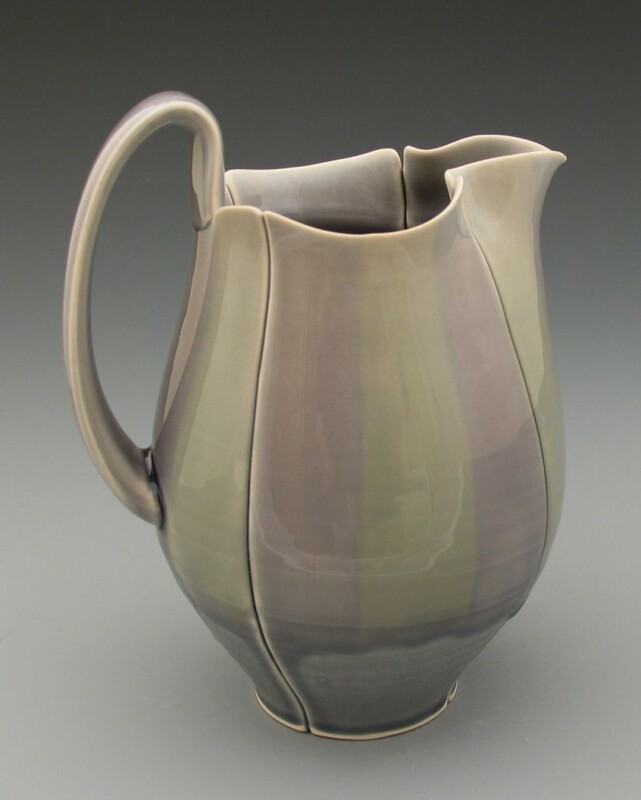 I use a base glaze recipe with two variations in colorants. I have found that for my work, two very close colors work better than two very different colors. There is a certain subtlety that I am going for. As an experiment, I made a very colorful set of stripes to compare with my more common subtle green stripes. The quality I like is the barely perceptible fluctuation between cool and warm, which is quite successful in the green cup on the right. 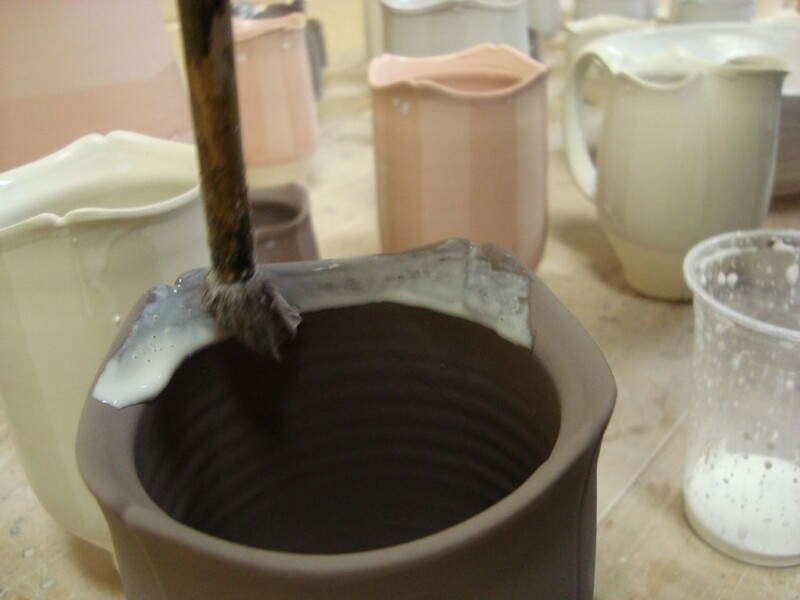 Once the glazes have been established, they are mixed to the exact same consistency. 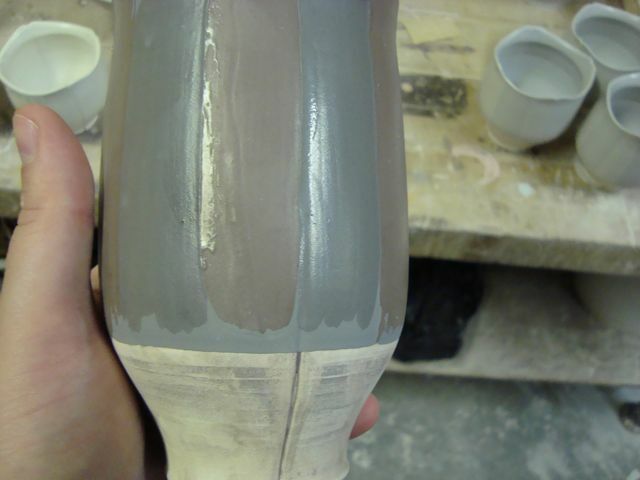 The goal will be to place on glaze next to the other in a continuous, even, unbroken coating of glaze. This begins with filling the pot with a glaze, and pouring it out while rotating, coating the entire inside as evenly as possible. I then immediately dip the outside to about three quarters of the way down. Above: Bisqued pots that have been spot-sanded to remove burrs and finger smudges, then rinsed, and allowed to dry overnight. 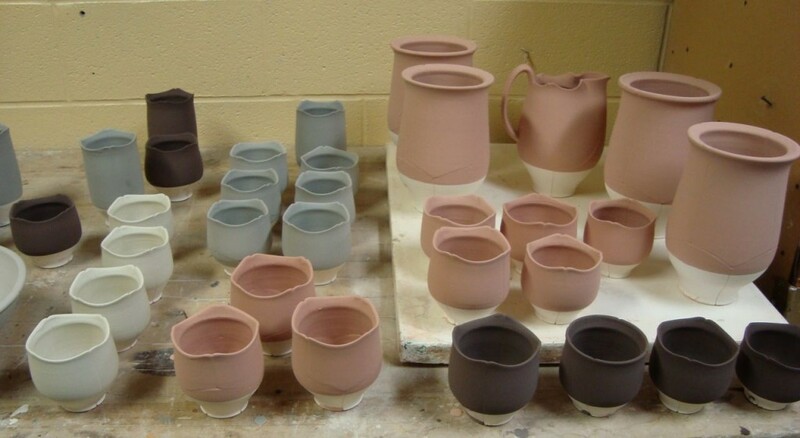 Above: The same pots have been dipped in the first color, coating the inside and three quarters of the outside, in various colors. 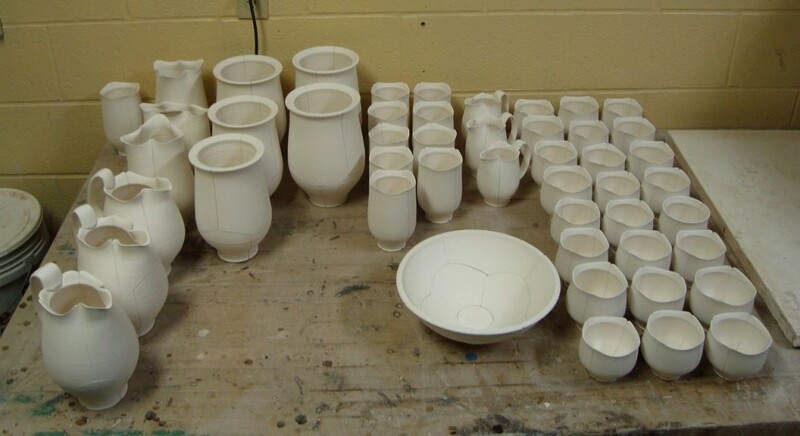 Once the pots have been dipped in the first glaze, they are allowed to dry for a few hours before the next step, waxing. Wax resist comes in several brands and forms. 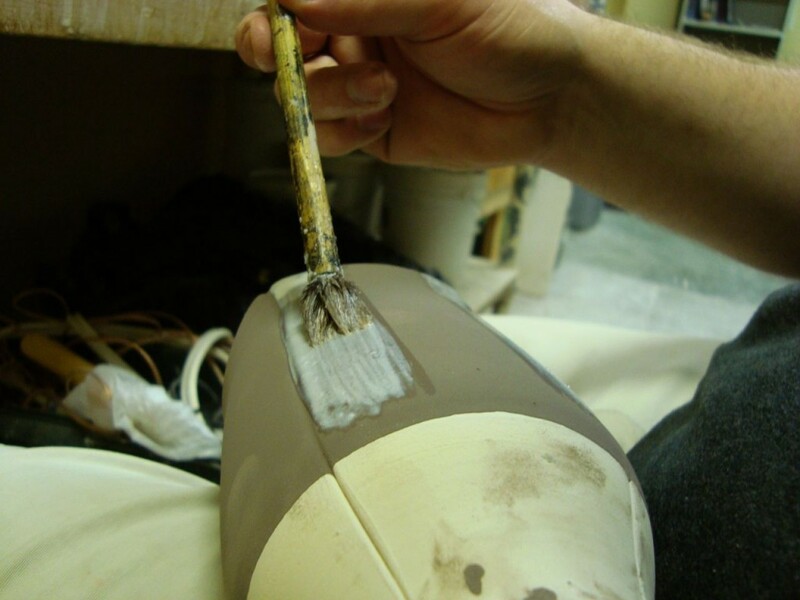 Some potters will wax the feet of their pots before glazing. I have never really understood this, as the wax will tend to pick up dust and debris from whatever surface it touches, eventually contaminating the foot. It seems counterproductive to me. 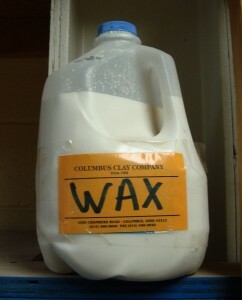 I go to great lengths to keep wax away from bare bisqueware, because once the wax touches it, glaze will not stick to it. Mistakes must be rinsed and re-fired, or hit with the blowtorch, which is a very risky thing to do to your beloved artwork. This is the kind of wax I use. I found it when I moved into my studio at U of L, and love it. It is ammonia based, so it smells horrible, but dries quickly, and sets up to a very slick, very hard surface. The packaging is hilarious to me, keep this away from non-ceramic people, as I’m quite positive that mistaking this for milk would be very, very bad! I use wax resist to protect the glaze that I want to stay on the pot. 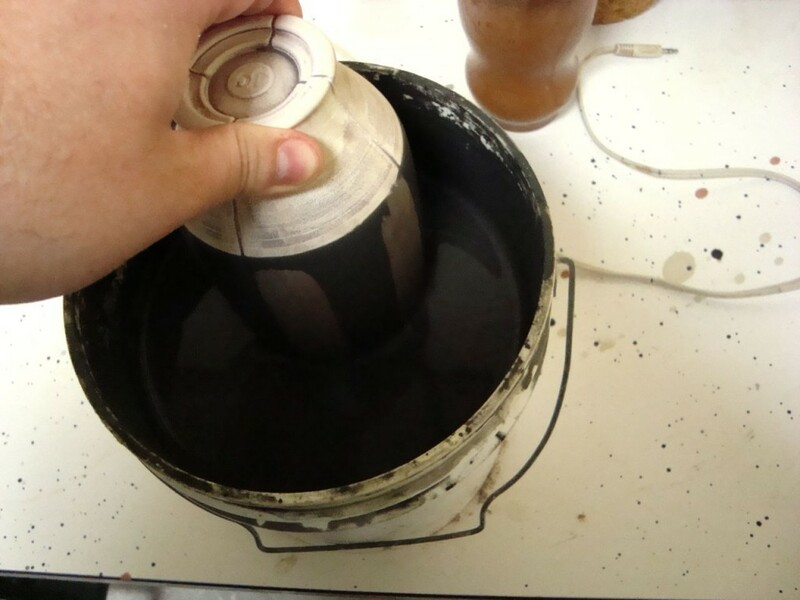 The wax resists the abrasion of the sponge, and then protects the glaze from mixing with other glazes that the pot is dipped into. To begin, I brush wax onto the inner part of the lip, to protect from any mistakes or splashes. Then I freehand the stripes onto the outer wall, careful not to let any wax touch the bare clay. There is an alternating three stripe pattern, where each of the four segments gets either one or two stripes painted onto it. The wax is set out to dry for about 2 hours, I know it is ready when it no longer appears to be white. Even in the thickest drips, it should be clear. 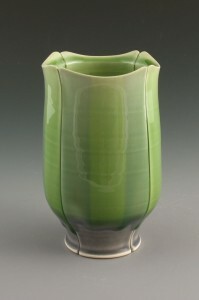 Once the wax has set up, The unprotected glaze needs to be removed. This is done with a wet sponge. I get a large bowl of water for rinsing the sponge, and separate the pots by color. 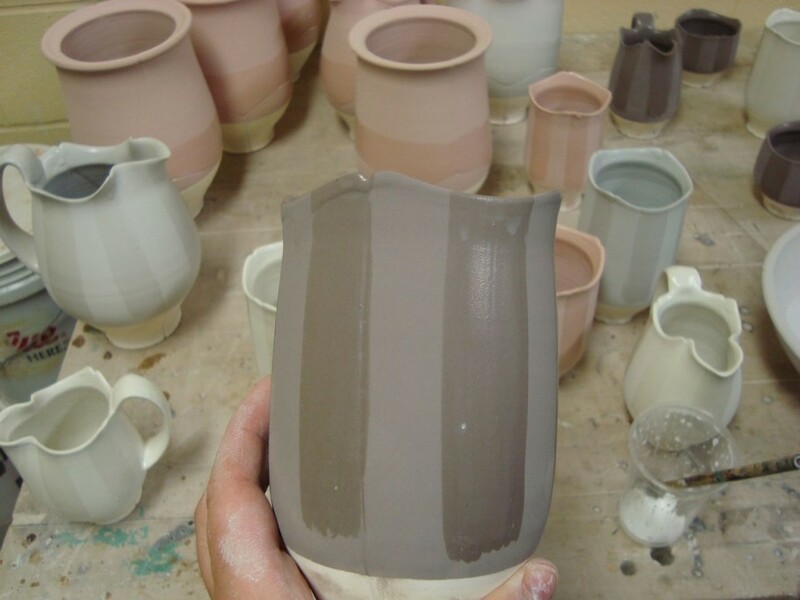 Each color is done as a group so that the sponged-off glaze can be eventually reused. It is important to wear gloves for this. 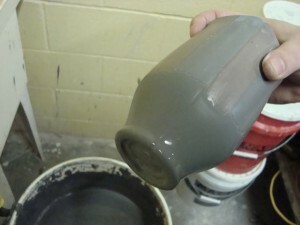 Glaze colorants in their raw form are not good the get on your hands. Eating and drinking while doing this is also a bad idea. 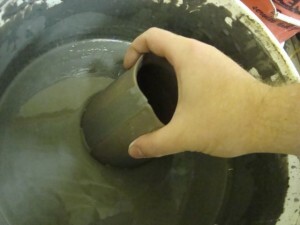 Using a soaking wet sponge, the glaze is gently wiped off of the pot. Lines can be straightened if need be using a utility knife. The pot is then left to dry overnight. The next morning begins with another dip in glaze. 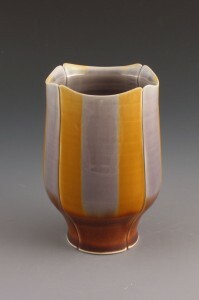 After a few hours to dry, the new glaze is protected using the wax in the same way as the first stripes. 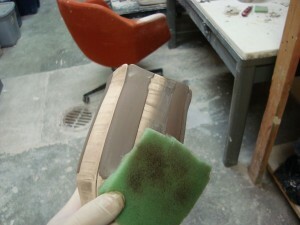 Once the wax dries, the excess is sponged off. 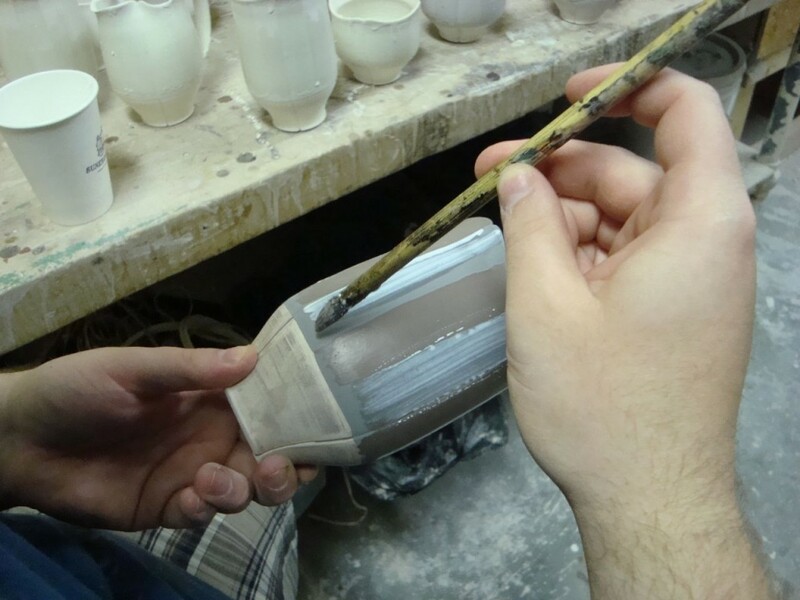 Once this is done, it is dipped in a matte glaze on the underside, and glaze is cleaned from the foot ring. I usually load the work directly into the kiln upon finishing. It’s amazing how well that wax resist seems to work. Those lines look damn sharp after the sponging off the unprotected area. What if wax resist didn’t exist? Is there another method that could pull this off? totally cool! it’s an amazing labor intensive process (i know about that)… cool wax though, i gave up early on the wax thing because i couldn’t find any that worked like the one you use, gotta get me some. i also dig the last step as a way of not having to use tongs or sprayers… ingenious! This all began with masking tape, which doesn’t work, then I tried using liquid latex, which also didn’t work, so I guess it would be impossible to do without wax. You’ve really got the kinks knocked out of that process! It’s nice to see the complexities of the process stack up. Thanks for sharing! Very cool technique. I wonder if shellac would work. I have painted with shellac on bone dry work and even the rigorous sponging didnot remove the painted pattern. Might work with glazes too, but the smell could give you a headache. Thanks for sharing! i didnt know you could put wax resist ontop of glazes and wipe away and the glaze stays. That is a very helpful tip! but why do you need the final wax to go all the way to the top of the cup. you are only dipping final glaze on bottom (underside)of piece. Just precaution for splashing?? thanks again & again your work is very impressive! Your writing is so thorough and informative, Jeff – thanks! Can you tell me the name of the ammonia-based was resist that you used, and/or the source? I tried to find it but was unsuccessful. I really need a truly great wax resist that actually does what it is supposed to do! Oops – never mind! I misread the label, and just found Columbus Clay Co.! They won’t tell me the name but it comes from Columbus Clay Company. It is the only wax they sell. It is awesome. Hey there, great work. 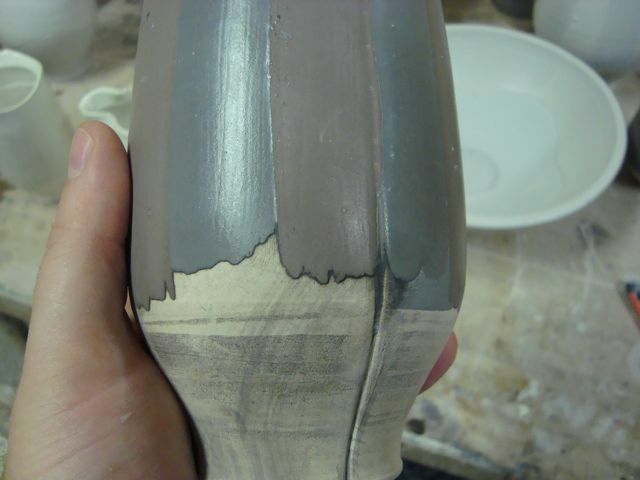 your use of transparent glaze with the stains is exactly where I am going, although a completely different use. I started with a Laguna Clear and the recommended 7% stain. way to much as all I get is opaque colored milk. I’m going to start retesting at 1%. a question I have for you is what is the think I should be thinking about the most when choosing a clear base glaze? It’s great that you’re so willing to share your technique that took you a long time to learn. I’m going to try it today! Thanks for the plug for our wax resist. Now packaged in a real gallon jug. Call 866 410 2529 to purchase. thanks for the information. I dont know where to find wax here..